I finished the painting! Not sure if it took me an hour…I’m just glad I finished it! So here it is, the final. Notice any differences? Here’s a little info about the piece…I really love the outdoors, weather permitting ;P so in the spring, summer and fall when I have the time I visit the Royal Botanical Gardens. I wander through their gardens, feeling happy and in awe with nature and the gorgeousness of it all. This past summer I visited the Hendrie Gardens and was so excited to see the waterlilies. I LOVE waterlilies. With a borrowed camera in hand, nicknamed Niki, I took as many photos as I could.This current painting is the result of said plein air photoshoot. 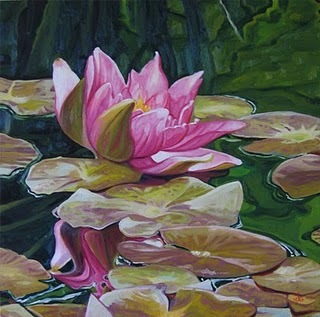 The upcoming series of posts will feature another painting entitled, “Red Waterlily”. I know not very imaginative title-wise but sometimes the literal works. One Response to "A little more about Pink Waterlily"
Fascinating. I assumed Monet just set up his easel near a srteam with lillies growing in it. I had no idea of the wonderful background story. I have seen many of the water lilly paintings -Museum of Modern Art in NY, if I remember correctly.